Feedback from massive stars is believed to play a critical role in driving galactic super-winds that enrich the intergalactic medium and shape the galaxy mass function, mass–metallicity relation and other global galaxy properties. In previous papers, we have introduced new numerical methods for implementing stellar feedback on sub-giant molecular cloud (sub-GMC) through galactic scales in numerical simulations of galaxies; the key physical processes include radiation pressure in the ultraviolet through infrared, supernovae (Type I and Type II), stellar winds (‘fast’ O star through ‘slow’ asymptotic giant branch winds), and HII photoionization. Here, we showthat these feedback mechanisms drive galactic winds with outflowrates as high as ∼10–20 times the galaxy star formation rate. 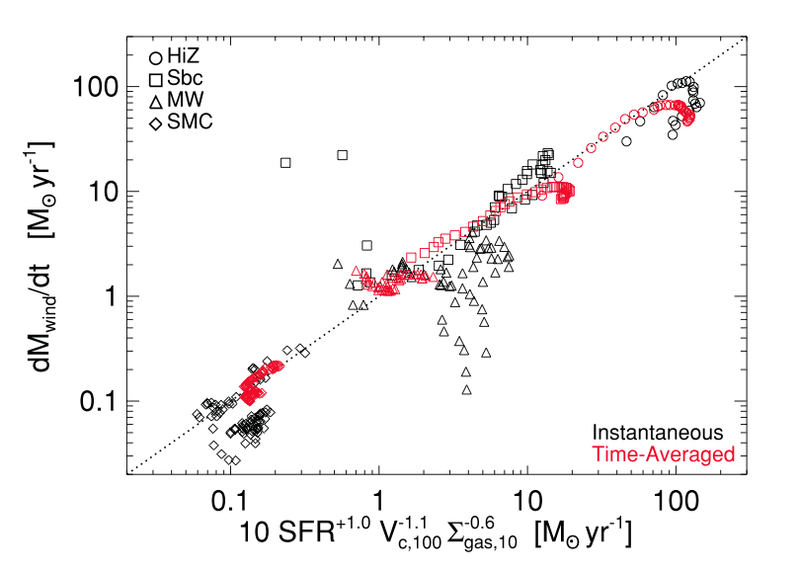 The mass-loading efficiency (wind mass-loss rate divided by the star formation rate) scales roughly as (where is the galaxy circular velocity), consistent with simple momentum-conservation expectations. We use our suite of simulations to study the relative contribution of each feedback mechanism to the generation of galactic winds in a range of galaxy models, from Small Magellanic Cloud-like dwarfs and Milky Way (MW) analogues to z ∼ 2 clumpy discs. In massive, gas-rich systems (local starbursts and high-z galaxies), radiation pressure dominates the wind generation. By contrast, for MW-like spirals and dwarf galaxies the gas densities are much lower and sources of shock-heated gas such as supernovae and stellar winds dominate the production of large-scale outflows. In all of our models, however, the winds have a complex multiphase structure that depends on the interaction between multiple feedback mechanisms operating on different spatial scales and time-scales: any single feedback mechanism fails to reproduce the winds observed.We use our simulations to provide fitting functions to the wind mass loading and velocities as a function of galaxy properties, for use in cosmological simulations and semi- analytic models. These differ from typically adopted formulae with an explicit dependence on the gas surface density that can be very important in both low-density dwarf galaxies and high-density gas-rich galaxies. Galaxy evolution cannot be properly understood without accounting for strong feedback from massive stars. Specifically, in cosmological models that don’t include feedback processes, the star formation rates in simulated galaxies are much too high, as gas quickly cools and collapses. Additionally, these simulations find that the total amount of gas present in galactic disks is too high. Both of these problems can be solved by including local outflows and galactic superwinds that remove baryons from the disks, slowing star formation and bringing simulations in line with observations. Such winds are difficult to include in simulations, however, because they have their origins in stellar feedback processes, which occur on small scales. Most simulations are either too low resolution to properly model these processes, or they make simplifying assumptions about the physics that prevent accurate modeling of winds. Thus, although we have seen observational evidence of such winds in real galaxies (for example, Coil et al. 2011; Hall et al. 2012), until recently simulations have not been able to generate galactic winds from first principles and have instead added them in manually. Hopkins, Quataert, and Murray for the first time present a series of numerical simulations that successfully reproduce galactic winds that are consistent with observations for a wide range of galaxy types. Unlike previous work, their simulations have both sufficiently high resolution to focus on small-scale processes in giant molecular clouds (GMCs) and star forming regions and the physics to account for multiple types of stellar feedback, not just thermal heating from supernovae. These simulations are also discussed in two companion papers (Hopkins et al. 2011 and Hopkins et al. 2012), which focus on the star formation histories and properties of the galactic ISM of simulated galaxies and outline rigorous numerical tests of the models. The 2011 paper was discussed in the 2011 Ay 201b journal club and is summarized nicely here. Simulations designed to study stellar feedback processes have, for the first time, succeeded in reproducing galactic winds capable of removing material from galaxies at several times the star formation rate when multiple feedback mechanisms are included. They also reproduce the observed inverse scaling of wind mass loading with galactic circular velocity, . Radiation pressure is the primary mechanism for the generation of winds in massive, gas-rich galaxies like local starburst galaxies and high redshift galaxies, while supernovae and stellar winds that shock-heat gas are more important in less gas-rich Milky Way-like galaxies and dwarf galaxies. The wind mass loading and velocity are shown to depend on the gas surface density, an effect which has not previously been quantified. The authors used the parallel TreeSPH code GADGET-3 (Springel 2005) to perform their simulations. The simulations include stars, gas, and dark matter and accounts for cooling, star formation, and stellar feedback. The types of stellar feedback mechanisms they include are local deposition of momentum from radiation pressure, supernovae, and stellar winds; long-range radiation pressure from photons that escape star forming regions; shock heating from supernovae and stellar winds; gas recycling; and photoheating of HII regions. The populations of young, massive stars responsible for most of these feedback mechanisms are evolved using standard stellar population models. HiZ: a massive, starburst galaxy at a redshift of 2, with properties chosen to resemble those of non-merging submillimeter galaxies. Sbc: a gas-rich spiral galaxy, with properties chosen to resemble those of luminous infrared galaxies (LIRGs). MW: a Milky Way-like spiral galaxy. SMC: a dwarf galaxy, with properties similar to those of the Small Magellanic Cloud. Simulations were run for each of these models at a range of resolutions (ranging from 10 pc to sub-pc smoothing lengths) to ensure numerical convergence before settling on a standard resolution. The standard simulations include about particles with masses of and have smoothing lengths of about 1-5 pc. (For more details, see the companion papers Hopkins et al. 2011 and Hopkins et al. 2012 or the appendix of this paper). The authors then ran a series of simulations with one or more feedback mechanisms turned off, to assess the relative importance of each mechanism to the properties of the winds generated in the standard model containing all of the feedback mechanisms. 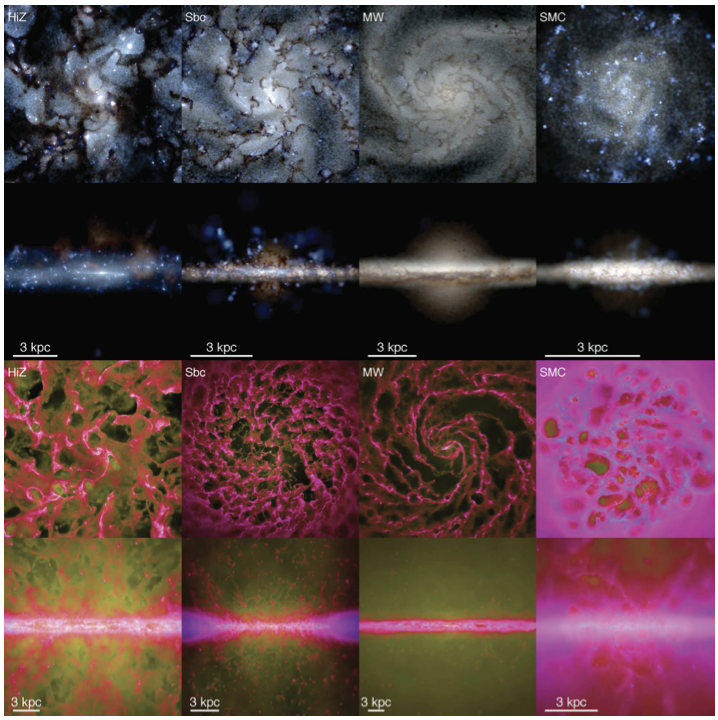 When all feedback mechanisms are included, the simulations produce the galaxy morphologies seen below. The paper also considers what each galaxy would look like in the X-ray, which traces the thermal emission from the outflows. The range of morphologies produced with all feedback mechanisms active for the four different model galaxies studied (from left to right: HiZ, Sbc, MW, and SMC). The top two rows show mock images of the galaxies in visible light and the bottom two rows show the distribution of gas at different temperatures (blue=cold molecular gas, pink=warm ionized gas, yellow=hot X-ray emitting gas). Taken from figure 1 of the paper. As shown above, all four galaxy models have clear outflows when all of these feedback mechanisms are included. When individual feedback mechanisms are turned off to study the relative importance of each mechanism in the different models, the strength of the outflows diminishes. 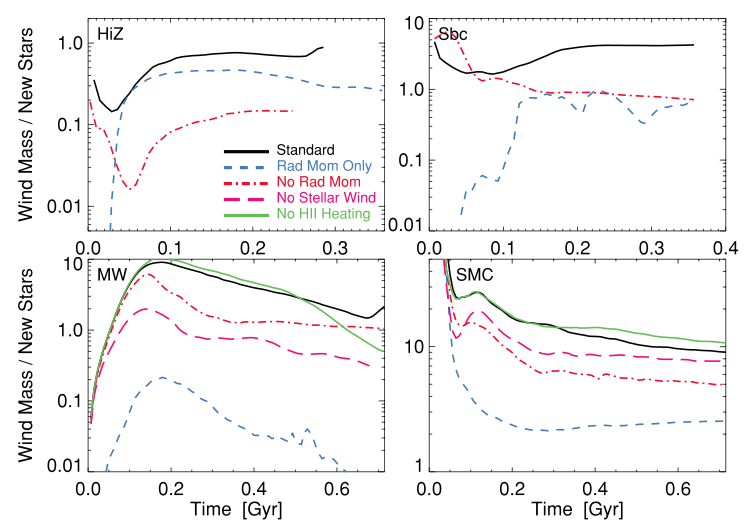 For the HiZ and Sbc models, radiation pressure is shown to be the most important contributing process, while for the MW and SMC models gas heating (from supernovae, stellar wind shock heating, and HII photoionization heating) is more important. The winds are found to consist of mostly (mostly ionized) warm (2000 < T < 400000) and (diffuse) hot (T > 400000) gas, with small amounts of (mostly molecular) colder gas (T < 2000K). Particles in the wind have a range of velocities, differing from simple simulations that often assume a wind with a single, constant speed. For the purpose of studying galaxy formation, the most important property of the wind is the total mass outflow rate, . This is often expressed in terms of the galactic wind mass-loading efficiency, defined as , where is the wind outflow rate and is the star formation rate. The galactic mass-loading efficiency for each galaxy model is shown below. By comparing the mass-loading efficiency produced by simulations with all feedback mechanisms turned on (the “standard model”) to simulations with some feedback mechanisms turned off, the importance of each mechanism becomes clear. While the standard model cannot be replicated without all of the feedback mechanisms turned on, radiation pressure is clearly much more important than heating for the HiZ case and less important than heating for the MW and SMC cases. The Sbc case is intermediate, with radiation pressure and heating being of comparable importance. Galactic wind-mass loading efficiency for each of the four galaxy models studied, taken from figure 8 of the paper. where , and are the uncertainties from the fits of individual simulated galaxies to the model. This relationship is plotted below along with instantaneous and time-averaged properties of simulated galaxies. The dependence of the wind mass loss rate on the star formation rate and the circular velocity of the galaxy match previous results and are easily understandable in terms of conservation of momentum, but the dependence on the surface density of the gas initially seems more surprising. Hopkins et al. posit that this is due to the effects of density on supernovae remnants: for low-density galaxies the expanding hot gas from the supernova will sweep up material with little resistance, increasing its momentum over time, while for high-density galaxies radiative cooling of this gas becomes more important, so it will impart less momentum to swept up material. Therefore supernovae in denser environments contribute less to the wind, all other factors being equal, introducing a dependence of the wind mass loss rate on gas surface density. The results from this paper are fairly robust, as the detailed treatment of multiple feedback mechanisms allows the authors to avoid making some of the simplifying assumptions that are often necessary in galaxy simulations (artificially turning off cooling to slow star formation rates, etc). The combination of high resolution simulations and more realistic physics does a good job of confirming previous numerical work and observational results. Needless to say, however, there is still room for improvement. One major caveat of these results is that all of the model galaxies are assumed to exist in isolation, with no surrounding intergalactic medium (IGM). In reality, galactic outflows will interact with the IGM and hot coronal gas already present in a halo around the galaxy, which affects the structure of the wind. Additionally, feedback effects from black holes and AGN are not discussed, nor are galactic inflows. Comparisons between observations and simulations have shown that AGN-driven winds cannot alone explain the observed star formation rates in real galaxies (Keres et al. 2009), but they may still be an important contributing factor. Furthermore, the authors note that their method of modeling radiation pressure is “quite approximate” and could be improved. Cosmic rays are not included and the scattering and absorption of UV and IR photons has been simplified. Computational limits (unresolvable processes) also place constraints on the robustness of the results. Many of the quantities discussed here are easily derivable from high-resolution simulations, but harder to estimate from observations of real galaxies or simulations that have lower resolution. A good discussion of how simulations compare to the observed galaxy population can be found in Keres et al. 2009. Measurements of hydrogen-alpha emission in galaxies can be used to infer their star formation rate and measurements of their X-ray halos can be used to infer the mass-loss rate from galactic winds, but this requires high-quality observational data that becomes increasingly difficult to capture for galaxies at non-zero redshift (Martin 1998). Depending on the resolution of a simulation or telescope, determining quantities like the galactic rotation curve and gas surface density may not be directly possible. When seeking to apply these results to understand the formation history of galaxies in observational data, these limitations should be taken into account.